← What if GI Joe were a romance comic? In a parallel universe, a zombie plague has decimated humanity, and given birth to the greatest threat of all: zombie super-villains! Possessing their old powers and intellect, but now even harder to kill, Doctor Doom, the Kingpin, Sabretooth and Morbius the Living Vampire are more dangerous than ever before. Driven by an insatiable hunger, the only thing that brings temporary relief is consuming living flesh. 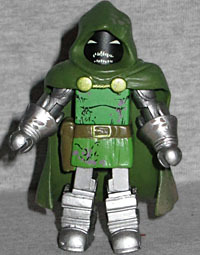 Zombie Dr. Doom is made using the Marvel vs. Capcom mold, which is a nice choice - it's the best version of him currently available, with good armor details like large boots and gloves, and sculpted pauldrons on his arms. He's armed with a pistol that can fit in the holster on his belt, and to show that he's been zombified, there's schmutz all over his tunic and cape (as well as the front of his gloves). You also get your choice of two heads: one where he's still wearing his mask (but has solid white eyes), and another where he's taken it off so he can have an easier time eating. Don't think you get to see his face, though - it's just a black, shadowy mass with white eyes and jagged teeth. Kingpin has traded in his purple pants for an all-white number, like a heavy-set Colonel Sanders - I guess that's what happens when he starts eating his own Famous Bowls! He has a chest cap, gloves, boots, and thigh and bicep coverings to make him big and bulky, because it wouldn't do to have a skinny Kingpin. A Skinpin. His suit is covered with grue, like the sloppiest all-you-can-eat barbecue rib buffet ever. He's also carrying his diamond-headed cane. The set comes with enough extra pieces that you can give Kingpin a second, alternate look. See, in the comic, Kingpin and a bunch of other mobsters got together to discuss ways to fight back against the zombie horde; unfortunately, they decided to team up with the Punisher in this plan, and the first thing he did was shoot them all. 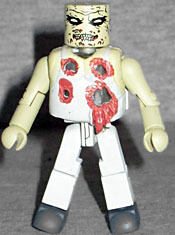 To duplicate that, we get the torso cap from the Shot Zombie, plus bare arms and normal-sized feet. 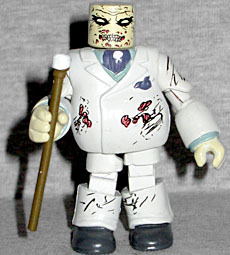 Zombie Kingpin has been dieting! Sabretooth appeared briefly in the first Marvel Zombies miniseries - just long enough to try to eat Galactus and get decapitated (off-panel) by Wolverine. This figure uses the chest cap from the Series 28 release, but you'll probably want to take it off, since the torso beneath is molded from clear plastic, in order to make it look like his entire side has been torn away. There are additional wounds painted on his arms and legs, and he includes a second ring of fur to fit around his shoulders if you opt for the "bare" torso. 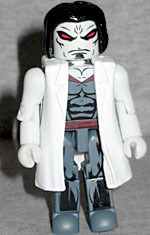 Our final figure is Morbius, the Living Zombie. Wait, Living Zombie? Not Morbius, the Living Vampire? Surprise! 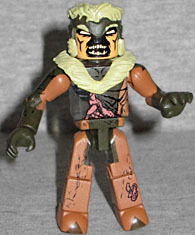 This figure is mostly identical to the one in the Strange Tales box set from a few years ago. The black paint on the body is the same pattern as before, but his V-neck isn't as deep, so we see less skin. The colors are more muted overall, with a greyish blue bodysuit and a "red" that's verging on purple. 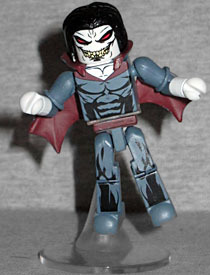 The previous Morbius looked superheroic - this one looks vampiric. Instead of a wild expression, his face looks like an impassive mask. Like the previous figure, he has wings, a collar, and one of the "spinning" flight stands. If you don't want that, the set includes two plain white arms and a labcoat, so you can have Morbius doing science - remember, he's a biologist, biochemist and neuroradiologist with a Ph.D. in biochemistry, and was Nobel Prize winner. So, like, a real scientist. The only drawback is that his white hands blend right into the white arms. The set also includes a second head for Morbius, this one with a creepier, more evil face - presumably the moment he declared himself a "vambie" (proving that even a brilliant doctor can lack the common sense to come up with the word "zompire"). The set also includes three pieces that don't belong to any specific figure - a desiccated right arm, a broken off left arm, and a chunk of meat. Give those to whoever you want to. This set of Villain Zombies is better than the first one, if only because all the characters in it actually appeared as zombies in the books. I didn't have high expectations for this four-pack, but it's a really good offering. This entry was posted in Art Asylum, Marvel, MMMR and tagged Daredevil, Fantastic Four, Minimates, Spider-Man, X-Men, zombies. Bookmark the permalink.